Of all my money skills games, this one is my favorite! This game is called "Trading Up". This post is a continuance from a previous post with other great freebies. You can check that one out here. I discovered this awesome resource while cruising a site called Math Wire. Among their other great teaching aids, this game is essential, in my opinion, for teaching money. Did I mention it's completely free?!?!? But I made a few tweaks to it so that the students would get more from it. Here's my version. Click on it for a copy. The first thing I changed was including a nickel slot in the dimes section. 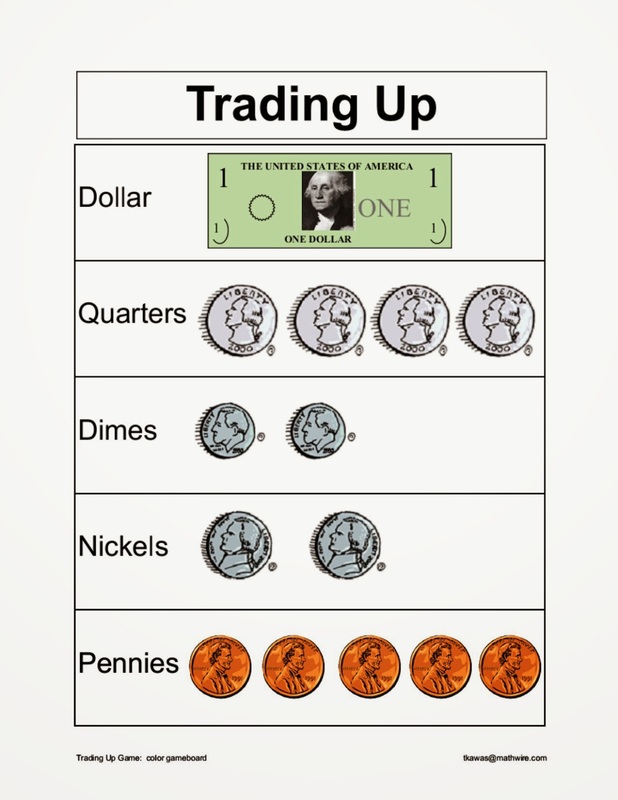 I know it might confuse the kids if there is a nickel sitting in the dimes section, but I really needed my classes to start thinking that a quarter can also be two dimes and a nickel. Besides, how are they supposed to trade up two dimes for a quarter? The second thing I tweaked was the addition of a half-dollar section. Though half-dollars aren't part of the core, I still feel they should be included. Not only that, but it helps to reinforce that 50 is half of 100. The spinner came from the resource book from our old math series, but you can easily create your own. Or you can have your kiddos roll a dice or draw cards out of a bag. The amounts are: 1¢, 2¢, 5¢, 6¢, 8¢, 11¢, and 13¢. Here's how you play. The student spins the spinner and finds the coins needed to make the amount spun. Then, they place the coins in the correct spaces on the work mat. For example, if they spun 11¢, they dig out a dime and a penny and place those on the mat. The dime fills a "dime" slot and a penny fills a "penny" slot. You get the idea. With each spin, they begin to fill up slots. 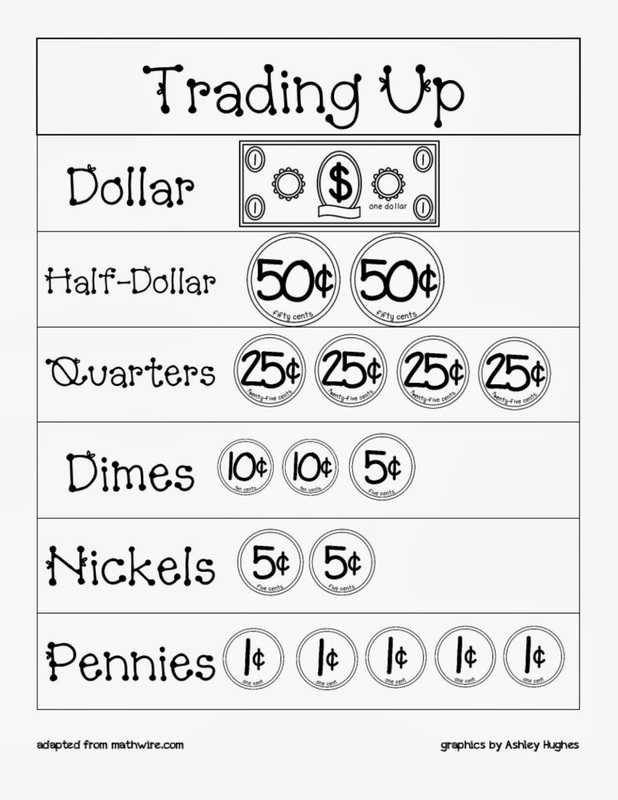 Once all the slots are filled in any certain section, the student needs to "Trade Up". If they have all five penny slots filled, they can trade those for a nickel. Two nickels for a dime, two dimes and a nickel for a quarter, and so on. The game continues until they have traded up to a dollar. The first to a dollar wins! Every so often, I call "Stop Action", which is a signal to immediately stop play and place hands flat on the desk. I learned this little trick from John and Jane Felling at Boxcars and One-Eyed Jacks. It is brilliant and works like a charm. I get instant attention from the whole class. And we all know how hard that is, especially when the kiddos are playing with manipulatives, don't we? Anyway...... When I call stop action, I have the students count up the money they've accumulated on their work mats and whisper the amount to their partner. Then, to assure accountability, I meander around and ask students to whisper it to me.